As the city’s fountains splash with green water and the historic squares and streets fill with the harmonious sounds of bagpipes, it’s a time for celebration and rich tradition this Augusta, Georgia native has grown to know and love. Along with the festivities comes a penchant for eating corned beef, shepherd’s pie and all things green. Whether you’ll be on the Georgia coast with us, or celebrating in spirit from afar, plan to bake my Green Mint Chocolate Chip cookies. They taste great paired with an Irish Coffee. 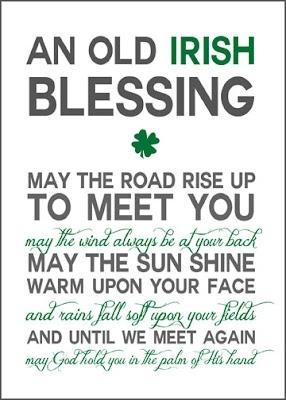 I’ll drink to that…Erin Go Bragh (translation: Ireland forever)! I took this video as I watched a band play during the festivities last year. 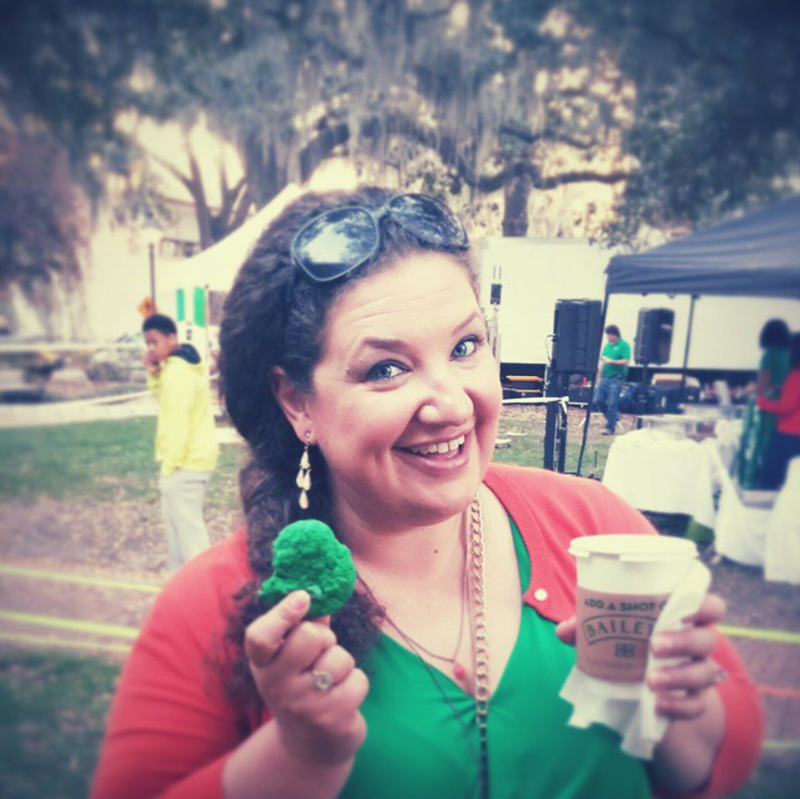 These are the sounds of St. Patrick’s Day in Savannah. Get out your clogging shoes! 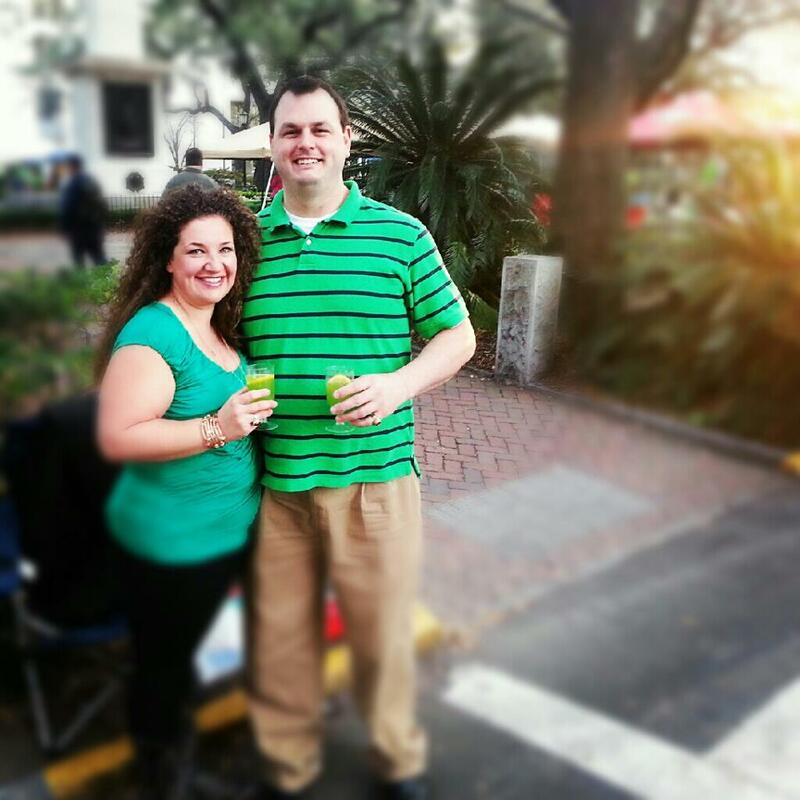 Rebekah and Kurt Lingenfelser say cheers with homemade green punch on St. Patrick’s Day 2014. These cookies are easy as pie to bake, y’all. They’re basically good old-fashioned chocolate chips, minus the nuts with a few drops of green food coloring. I swap out the traditional semi-sweet chocolate chips for Dark Chocolate and Mint Morsels for a surprising depth of flavor. Thanks to NESTLÉ® TOLL HOUSE® for inspiring this recipe! Having fun with special friends, Will and Sarah Forrester. Pre-heat oven to 350° F. Combine flour, baking soda and salt in small bowl. Beat butter, granulated sugar, brown sugar and vanilla extract in large mixer bowl until creamy. Add eggs, one at a time, beating well after each addition. Gradually beat in flour mixture. Add green food coloring. Stir in morsels. Drop dough by rounded tablespoon onto ungreased baking sheets.Bake for 11 to 13 minutes or until golden brown. Cool on baking sheets for 2 minutes; remove to wire racks to cool completely.Wait, there’s more!